As I told, the user threads are the normal threads you see and use in your day to day coding. Any thread you create from main thread becomes a user thread. If you want to create a daemon thread then you need to call the setDaemon(true) method to make it a daemon. Another key point to remember is that any new thread spawned from a daemon thread also becomes a daemon because thread inherits their daemon property from the thread which creates them. Since main thread is a non-daemon thread, any thread spawned from main also becomes non-daemon or a user thread. Let's see a couple of more difference between user and daemon thread in Java. First and foremost difference is that JVM will not wait for daemon thread to finish their work but it will wait for any active user thread. You might have noticed this behavior while running Java program in Eclipse that even if your main thread has finished the top right button is still red, showing that Java program is still running. This is due to any user thread spawned from the main thread, but with main thead you don't see that red dot in Eclipse. Another difference between them is that daemon thread is mostly created by JVM e.g. for some garbage collection job. On the other hand user thread is usually created by the application for executing some task concurrently. You can also check The Definitive guide to Java Performance to learn more about what JVM does during shutdown. Another key difference between daemon and user thread is that daemons are not used for any critical task. Any important task is done by non-daemon or user thread. A daemon thread is generally used for some background tasks which are not critical. As compared to user thread, the daemon threads are low priority thread. Which means they won't get CPU as easily as a user thread can get. 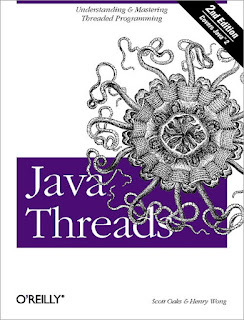 See Java Thread 3rd edition to learn more about Thread priority and how CPU is allocated betwee threads. The user thread is closed by application or by itself but JVM will force daemon thread to terminate if all user threads have finished their execution. A daemon thread cannot keep the JVM running but a user thread can. This is the most critical difference between daemon and user thread which you should remember. 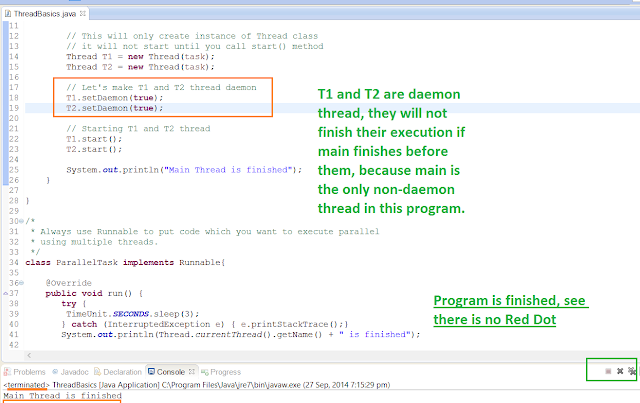 Here is our sample Java program to demonstrate the real difference between a daemon and user thread in Java. It also shows you how to create a daemon thread in Java or how to make a normal thread daemon by calling the setDaemon(true) in Java. By default any thread created from the main thread is non-daemon or user thread. * Java Program to demonstrate difference beween a daemon and a user thread . * This program also tells how to make a thread daemon in Java. That's all about the difference between daemon and a non-daemon thread in Java. One of the important thing to remember that JVM will forcefully terminate all the active daemon thread if there is no user thread is pending execution or active, so don't perform any critical task on daemon thread. Also, remember, that thread inherit daemon property from the thread which creates it. For example, if you spawn a new thread from main() then they will be non-daemon or user thread and you need to call the setDaemon(true) to make them daemon, on the other hand, if you spawn a new thread from a daemon thread then by default it will be a daemon thread. Thanks for reading this article so far. If you like this interview question and my explanation then please share with your friends and colleagues. If you have any questions or feedback then please drop a note. Thanks @Unknown for your kind words and pointing this typo. I'll correct it now.